the NEW Hotel Annabella is situated at 3rd floor of a magnificent old classic Florentine style building in the historical center, very close to the central train station of Firenze S. Maria Novella (100 mt., only 3 minutes walk), nearby the Exhibition Center of Fortezza da Basso, and in front of the Congress Center and the Business Center. The hotel is very near the wonderful Church of S. Maria Novella, the Medici Chapels and the traditional Market of San Lorenzo, next to the marvellous Church of San Lorenzo. 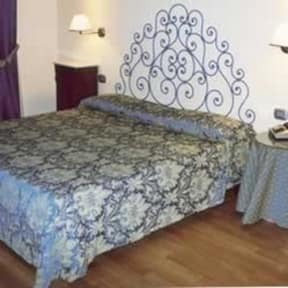 The hotel has an elevator and all rooms are equipped with private bath, shower, A/C, telephone, and satellite TV. 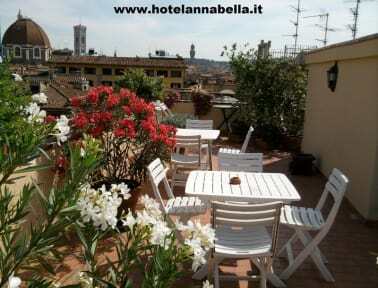 There is also a nice terrace on the roof where guests can sunbathe and enjoy a marvellous view on the city. On demand, it's possible to have rooms with balcony. Information about museum reservations and wine-and-food tours in Florence and in Tuscany countryside. Breakfast is Continental with buffet. Internet and fax service in hotel. Before departure, you can leave your baggages in hotel free of charge and for all the time needed. Credit Cards accepted: VISA, MC, JCB, AMERICAN EXPRESS. There's possibility of pay-parking or garage in the area. Hotel run by a family; they take care of their hotel personally and speak English, Spanish, French. Stayed at the double luxary room. It was too close to the hotel reception area and noisy from that. We could hear phone ringing and staff talking until very late at night. Also, the bed was too hard for me.